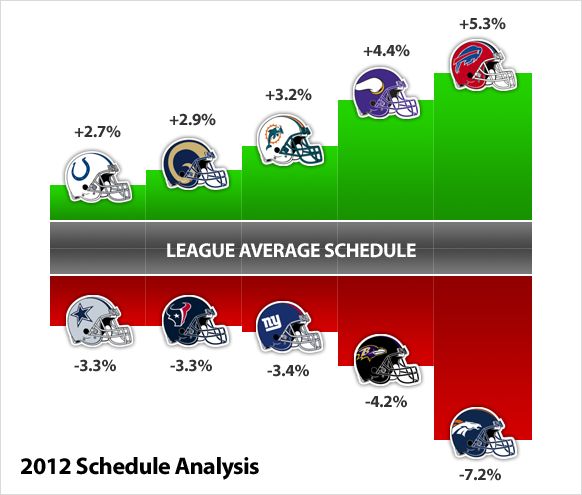 According to this analysis, Broncos have the toughest schedule. Wow, look at that clump of away games in the middle of the year. Schedule seems hard now, but you always have to remember that those rankings are just based on finish last year and it's always a crap shoot to determine schedule strength now. Schedule looks very tough. The primetime games at the beginning of the season are pretty cool. I will say this... Because Manning has been out all of last year he will likely start to break down towards the end of the season, right when our schedule gets easier. It looks rough right now, but we still have Peyton Manning. This is just fine. Brock Osweiller will lead the charge to the Super Bowl. This is just prep for the playoffs. Wait! I meant Peyton Manning...sorry. Broncos 16-0 and the rest?? Who cares. If Manning can stay healthy, and our division is as weak as it has been we can go 10-6 or 9-7. However, if Manning goes down early we will be in position to draft a QBOTF. I disagree about SD. Their defense was 11th worst in points given up and gave up 24 points a game. If your offense can score more, that isn't a huge deal. However, SD's offense has gotten a lot worse this offseason. They lost their #1 reciever and a guy who had a bunch of carries last year in Tolbert. Who knows if Gates is going to play a 16 game season. They need Oline help too. Just about every aspect of their offense is below average outside of QB, one RB and TE if Gates is healthy. I think SD is the worst team in the division. At least Oakland has young talent to develop.